Brennan Poole hopes his ARCA Racing Series success carries over to his 15 NASCAR XFINITY Series races this season. You can tell a driver is looking forward to his first NASCAR start when he’s pumped about his helmet. Prior to speaking with FOXSports.com earlier this week, 24-year-old Brennan Poole had just gotten his helmet back from the paint shop, the first custom paint job he’s ever had. The excitement level is through the roof this week for The Woodlands, Texas, native. 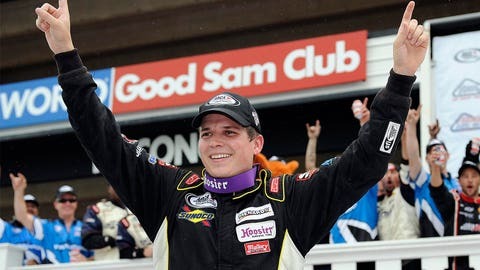 A six-time winner in the ARCA Racing Series, Poole is making his first XFINITY Series start for HScott Motorsports with Chip Ganassi at Las Vegas Motor Speedway. Brought on to run 15 XFINITY Series races with sponsor DC Solar Solutions, Poole is still pinching himself about the opportunity to make his mark in NASCAR. "The first time I walked into the shop, I couldn’t believe I was standing in the shop," Poole said. "The first time I saw my name on the car … it just blows my mind to see cars on the shop floor with my name on them. I’m still kind of in shock, but I know I have a job to go do, and I’m doing everything I can to prepare the best I can for it." In preparation for his first start, Poole has spent a lot of time at the shop getting to know the team. He also accompanied the group to the season’s first two races at Daytona International Speedway and Atlanta Motor Speedway where he tried to absorb as much information as possible. "I just talk to as many people as I can," he said. "They’ve got a lot of great people over there at the Ganassi shop. I’ve talked to Jamie McMurray, Kyle (Larson) — I knew Kyle a little bit better than the other guys because I’ve just been around him the most. I’ve learned some things from them, some things that will definitely carry over." In addition to working closely with the team, Poole has spent a great deal of time working with Dartfish, a program that allows drivers to compare laps by overlaying video of their laps with those of other drivers. Over the past few seasons, he has worked with teams filming for their Dartfish programs, something that he hopes will be to his advantage once he climbs inside the car. "I’ve learned a lot from just watching the Dartfish," he said. "I’ve probably watched the Las Vegas race 20 times. I know what’s going to happen before it even happens, I’ve watched it so much." Along with turning to his Ganassi teammates, Poole has also turned to former crew chief Steve Letarte, and current Ganassi crew chief Matt McCall for advice on how to relay information to Mike Shiplett, who will be Poole’s crew chief. While he admits to being a bit nervous heading into this weekend’s race, Poole said the biggest thing he is nervous about is the unknown. "I feel like as soon as I get out there and get in the car and get on the track, that will kind of go away," he said. "I just need to go out, do my job and have fun driving race cars. "I’m going to go out and take it one lap at a time and try to run the best lap I can each lap, and try to put ourselves in the best position to wind up with a chance to win the race," he said. Already a winner on the ARCA Racing Series, Poole hopes to take all he has learned and apply it to the XFINITY Series. But he understands there is always more to take in. "As a race car driver, you always want to get out there and race the best," he said. "I want to beat them. I’m on a mission to learn as much as I possibly can, take everything I’ve learned and build on that, and continue to build it and try to beat them. "That’s what I want to do. I want to be in this sport for a long time. I want to win races and championships, and this is my first opportunity."